Unless you've put yourself on an Instagram ban over the past six months or so, you've probably noticed a rise in oddly shaped slabs of crystals and crystal rollers popping up in your feed. You've probably also wondered what on earth these oddly shaped slabs of crystals are and why they're being rubbed all over peoples' faces. Enter the facial tool. Facial tools aren't a new thing. In fact, they've been used in Chinese and Egyptian beauty rituals since the 17th Century, and Cleopatra reportedly used to rub rose quartz stones she found at the bottom of a river over her face as part of her routine. But what do they do, and which ones are worth the hype? Keep reading to find out the best beauty tools a series of facialists recommend. Kate Wheldal-Schonfrucht, a skincare expert and facialist, recommends crystal or jade rollers due to their lymphatic drainage properties. According to Kate, increasing the lymphatic drainage in the skin is something we often neglect, but not doing it can cause a puffy, sluggish effect. (Not what we want.) Kate recommends keeping your roller in the fridge, as the cold can help soothe the skin, and while it may help short term, it's not a long-term solution. Let it be known that diet, environment and skincare must be looked at if your face continues to look and feel puffy. I like to use my jade roller on targeted areas (because yes, I'm that person who uses two types of facial tools daily) like my forehead and eye area. But to get the most out of your roller, ensure you're rolling towards your lymphatic drainage points—located at the side of your face—in upward motions. You can use your roller on clean skin, or you can use it post-skincare to really help penetrate the skin. Shop my jade roller pick below and the serum I like to use it with. Your jade roller needn't be fancy, although it will sit pretty on your dressing table. This Yu Ling Roller will do the job perfectly and last you a lifetime. Not all facial rollers have to be jade. We love this rose quartz one too. Get your hair off your face before you jade roll with one of Slip's pure silk headbands. It's made from 100% pure mulberry silk and won't leave kinks or do any further damage to your hair. Lumene is a brand I've been obsessed with for a while, and I love keeping this lightweight serum in the fridge alongside my roller for a cooling effect. Packed full of Nordic Chaga and pure Arctic spring water, this super-charged serum helps to absorb moisture and leaves your skin hydrated—especially when paired with a roller. Once you've rolled your serum into your skin, finish your routine with this whipped cream by Drunk Elephant. It contains a blend of six rare African oils and will replenish and save dry, dull skin. Kate also highly rates at-home derma-rolling for glowing skin. Derma-rolling might feel and look more invasive than a crystal facial tool (and that's because it is), but hear me out. Derma-rolling or micro-needling is a small device made up of tiny needles, which when rolled across your skin create small punctures to create a very monitored micro-injury in the skin. Don't fear: These punctures help to trick your skin into a need to renew and regenerate its cell turnover, increasing the activity of collagen which helps to plump the skin. They also create small channels in your skin's layers so any products used post–derma-rolling can penetrate deeper, which helps to improve how quickly they work. Kate recommends using an at-home derma-roller two or three times a week as your skin is constantly renewing itself. They are more expensive than a crystal roller, and Kate urges caution when purchasing as the needles need to be made from high-quality titanium. That being said, a derma-roller can drastically help if you want to up your skincare. It's also important to note that if your skincare products are of lesser quality, don't use a derma-roller: Kate believes that your beauty regime should start and end with your skincare choices, so if you're using low-quality products, you don't want to then penetrate them deeper by using a derma-roller. Get to know your skin, find out it likes and doesn't like, and then add in something slightly more invasive like a derma roller. Your beauty regime should start and end with your skincare choices, and then if you want added benefits, you can add in a facial tool. Shop what I'd use with my derma-roller below. Chances are you're going to have to spend up to £100 for a good derma-roller, but don't let that put you off. This ECooking one helps to fight fine lines, wrinkles and reduce the appearance of pores, scars and pigmentation. Oh, and it will leave you with glowing skin. This 3-in-1 face roller has customisable needle heads so you can tailor it to your own skin—or up the ante when your skin has become used to a specific needle length. You can even use this on your body if you really want to give derma rolling a go. I suffer from dehydrated skin, so I love using a serum like Avène's Hydrance Intense Serum post–derma-roll. It's formulated with Avène's mineral-rich thermal spring water and works to form water reservoirs in the skin to rehydrate. The result after using this with a derma-roller? Plump, healthy glowing skin. Before you scream at the price tag, hear us out. This cream is a firm favourite among celebrities, facialists and beauty editors (us included) and is the brainchild of world-leading stem cell and biomedical scientist Augustinus Bader. It's fast-absorbing, weightless and helps reduce the signs of aging, so it's the perfect cream to use post–derma-roll. After using something slightly more invasive like a derma roller, give your under-eye area a little more attention with something like Caudalie's Smoothing Eye Cream. It works to strengthen the delicate skin around the eye area and reduces dark circles. Okay, so a facial massage isn't exactly a facial tool, but Emina Avdukic, Lumene's in-house facialist and skincare expert, credits facial massage as the best type of facial care you can do—and it's completely free. Emina suggests going upwards and outwards movements like you would with your roller or gua sha so you lift the skin and drain out any congestion to your lymph nodes. You can do facial massage at any point during your skincare routine or when you fancy a little pick me up, but I like to do this after using a rich cleansing balm to really melt the product into my skin and get rid of any traces of my day. Shop my current favourite cleansing balm below. I did say I was a big fan of Lumene's products, and this Nordic Pure Glow Cleansing Balm is my current go-to for when I want to give my skin a treat. Containing wild Arctic Cloudberry seed oil and Lumene's Nordic-C complex with vitamin C, this supercharged balm helps to enhance radiance and makes you look instantly brighter. I recommend using this at night time to take your makeup off and really massaging it into your skin. Who doesn't love massaging a luxurious rose oil into their skin every now and then? This Pixi one is perfect if you're in need of a pick-me-up facial massage. Emina also recommends using a gua sha in the same way you would do facial massage. She would use a gua sha after you've cleansed and toned your skin before you've put your serum and moisturiser. you can then use your gua sha after applying your serum to help it absorb better into the skin. 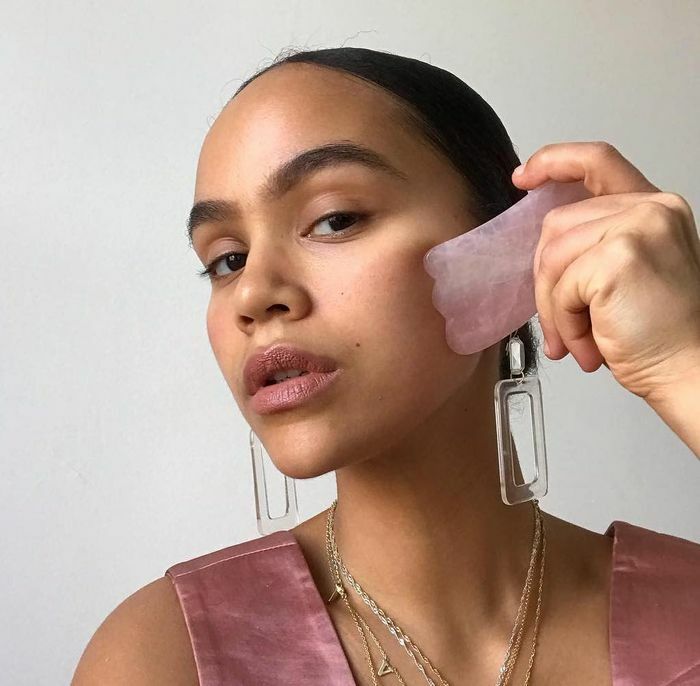 This Odacité gua sha is made from rose quartz and will help to firm contours as well as smooth and revitalise your skin. As we mentioned above, your facial tool doesn't need to be made of a specific crystal to work, but most come in either rose quartz or jade. Try this jade one if green is more your vibe. Dr Dennis is a brand I wholeheartedly adore, and this C+ Collagen Brightening serum is the perfect pal for your gua sha. Simply prep the skin with it and recharge your skin. This oil-free moisturiser will leave your skin glowing and fresh. It's packed full of watermelon extracts to help calm inflamed skin. Emina told me that using tools can really help to boost the benefits of the skincare and works on the deeper tissues of the skin as well, but it's totally down to you and your preferences which you use. 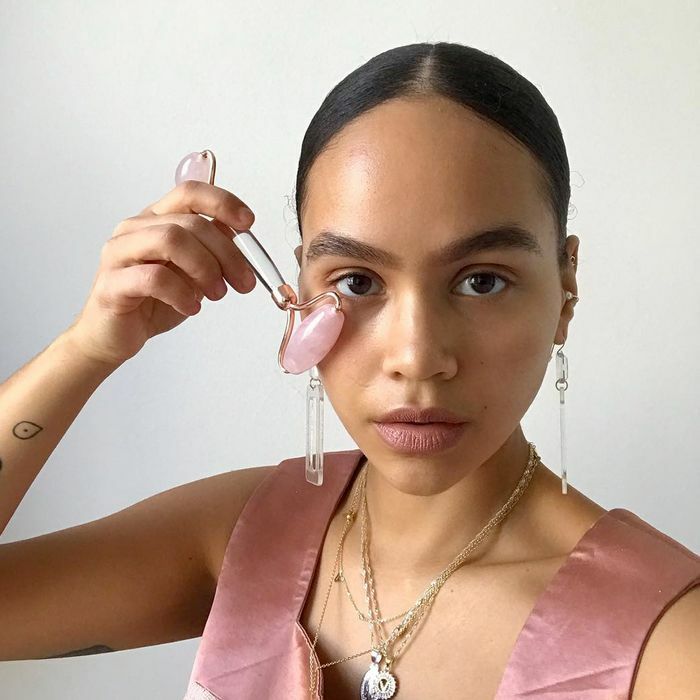 I use a combination of a jade roller and a gua sha, for no other reason than I love the way a gua sha feels on my jawline and cheeks, and I'm obsessed with rolling my forehead with my jade roller. Does it make a huge difference which I use? Probably not. But does it make a huge difference to the appearance of skin if I go a day without using one or the other? Absolutely. I am noticeably puffier and tired-looking, which is why I've made a conscious effort to include a facial tool into my daily routine, and why I highly recommend you do the same. Plus, who doesn't love having a facial massage? Up next, these are the beauty products our mums swear by.